The Top Picks on this page are chosen by God Save The Points based on the combinations of card features or bonuses which we think are the most exciting right now. In the interest of full disclosure, this site earns a referral bonus for anyone that’s approved through some of the below links. God Save The Points has partnered with this site for coverage of credit card content. These are the best publicly available offers that we have found for each card. Please check out our advertiser policy for further details about the partners we work with. Thanks for your support! Turning every day purchases into extraordinary trips is the best. These great cards offer benefits, perks and points to help travelers see the world, for less. We’ll stay on top of the best credit card offers to bring you what we think are the best deals each month. The updates to this card (including the introduction of airline transfers) make this an incredibly well-rounded card. While the annual fee is high the card comes with lots of benefits that help negate the annual fee, including a $200 Airline Fee Credit, which gives you up to $200 a year in baggage fees and more at one airline. 5X Membership Rewards® points on flights booked directly with airlines or with American Express Travel. 5X Membership Rewards® points on eligible hotels booked on amextravel.com. Enjoy Uber VIP status and free rides in the U.S. up to $15 each month, plus a bonus $20 in December. That can be up to $200 in annual Uber savings. As a Platinum Card Member, you can enjoy access to the Global Lounge Collection, the only credit card airport lounge access program that includes proprietary lounge locations around the world.Receive complimentary benefits with an average total value of $550 with Fine Hotels & Resorts. Get up to $100 in statement credits annually for purchases at Saks Fifth Avenue on your Platinum Card®. That's up to $50 in statement credits semi-annually. Enrollment required. Ultimate Rewards points can be transferred at a 1:1 ratio to United, Hyatt, and many other programs. The card is also great for everyday spend given that it offers double points on dining and travel. This is probably the most-used card in my wallet. This is an excellent card for those who spend a lot on dining and want to earn cash back, rather than travel rewards! This card is worth keeping for Anniversary free night certificate, plus the 15 nights towards elite status annually. And the 6x points per dollar for Marriott stays certainly doesn't hurt! This card has a great return for a cash-back card with no annual fee. This is a fantastic bonus, especially as these miles can be pooled with any miles you’re earning on your personal account. A cash-back card can be a good way to cut costs in other areas, saving money for travel! Earning unlimited 2% cash back could mean thousands of dollars each year going back into your business. Use Spark Cash across all your business spend, with no categories to limit your purchasing. Rewards won't expire for the life of the account, and you can redeem your cash back for any amount. This is one of the best travel cashback credit cards out there, and this is the best offer we’ve seen on the card. And you’re getting a fantastic welcome bonus to top it all off! Earn unlimited 2X miles on every purchase; Chip card technology, so paying for your purchases is more secure at chip-card terminals in the U.S. and abroad. Get 5% miles back to use toward your next redemption, every time you redeem for travel statement credits. This card gives you a full Admirals Club Membership for you and access for guests traveling with you*, in addition to complimentary Admirals Club® Lounge access for authorized users. There are no limits to the amount of cash back you can earn. For a card with no annual fee, that’s a return which is tough to beat. This is a great card for small businesses, given that this card has no annual fee yet still accrues 5x points in several categories. The card has a great sign-up bonus, and on top of that has lots of perks that make it valuable long term. I value Ultimate Rewards points at ~1.7 cents each, so to me the 50,000 points are worth $850, and that's before factoring in the travel credit and other great perks. Earning 4X Membership Rewards® for small business expenses is an awesome return, and we especially like that it automatically applies to the categories you use most in a billing cycle, rather than having to choose just one or two each year. Membership Rewards has many transfer partners, including Aeroplan, British Airways, Delta, and Singapore, and this card lets you earn great bonuses in the categories that many of us use most often. Capital One miles have historically been most useful for domestic economy flights, particularly if you have to travel over peak dates, but the new mileage transfer option is a game-changer, and makes these points much more valuable. Arguably the coolest feature of this new card is Citi will round up your purchase to the nearest 10 ThankYou points. Make a $1 purchase? You’ll earn 10 ThankYou points. Make an $11 purchase? You’ll earn 20 ThankYou points. This is a very interesting rewards structure that makes this card perfect for everyday purchases. Earn 2 ThankYou® Points per $1 spent at supermarkets and gas stations for the first $6,000 per year and then 1 ThankYou® Point per $1 spent thereafter. The only credit card that automatically rounds up to the nearest 10 points on every purchase. A $2 coffee earns 10 points. A $12 meal earns you 20 points. There is no cap on purchases that are rounded up. Get 10% Points Back for the first 100,000 ThankYou® Points you redeem per year. Hyatt hit it out of the park with the new card. The card is worth holding onto for the anniversary free night certificate and the five elite nights towards status annually, which more than justify the annual fee, not to mention the pathway to elite status based on your spending. Earn up to 50,000 Bonus Points - 25,000 Bonus Points after you spend $3,000 on purchases in the first 3 months from account opening. Plus an additional 25,000 Bonus Points after you spend a total of $6,000 on purchases within the first 6 months of account opening. The way I view it, this is a card that’s worth holding onto for the anniversary free night certificate, valid at a hotel that retails for up to 35,000 Marriott points per night. That benefit alone should more than justify the annual fee. Earn 6X points for every $1 spent at over 6,700+ participating Marriott Bonvoy hotels and 2X points everywhere else. An additional Free Night Award (valued up to 35,000 points) every year after account anniversary. 15 Elite Night Credits each calendar year. This is a fantastic welcome bonus, especially for a small business card. You'll enjoy complimentary Gold status just for keeping the card, with great opportunities to earn points and free Weekend Night Rewards. Earn Hilton Honors Bonus Points for each dollar of eligible purchases on your Card: 12X at hotels and resorts in the Hilton portfolio, 6X on Select Business & Travel Purchases, 3X Everywhere Else. Earn a Weekend Night Reward from Hilton Honors after you spend $15,000 in purchases on your Card in a calendar year. Earn another Weekend Night Reward from Hilton Honors after you spend an additional $45,000 in purchases on your Card in the same calendar year. Relax with 10 free airport lounge visits each year once enrolled in complimentary Priority Pass™ Select membership, which offers access to over 1,000 lounges in over 120 countries. The new earnings rates make this a great way to earn American miles, not to mention the generous welcome bonus. This card also gives you a 10% rebate when you redeem AAdvantage miles, and often has targeted spend bonuses throughout the year. Certain versions of ThankYou points, including the ones offered with this card, can be transferred to airline partners at a 1:1 ratio, which gives you more options for aspirational travel. Capital One points are most useful for domestic economy flights, particularly if you have to travel over peak dates. Earn 1.5 miles per $1 on every purchase. Plus, a one-time bonus of 20,000 miles once you spend $3,000 on purchases within 3 months from account opening. This card allows you to earn 60,000 Rapid Rewards® points which is a bit more than 50% of what you need to earn within a calendar year for Southwest's Companion Pass. This card comes with some worthwhile benefits for United flyers, especially the PQD waiver for $25k in annual spend. Earn 2 miles per $1 spent at restaurants, on hotel stays and on purchases from United. 1 mile per $1 spent on all other purchases. The annual free night certificate valid at many IHG properties and Platinum elite status for as long as you have the card make this a potentially good value, as most of those hotels would cost more than $89 per night. This is a great way to rack up Ultimate Rewards points on a no annual fee credit card. This card complements the Chase Sapphire Preferred® Card very well, given that the points from all cards can be pooled. This card accrues 3x Ultimate Rewards on all purchases in your first year up to $20,000 spent. After that you'll earn 1.5 Ultimate Rewards points per dollar spent. That’s an incredible return on everyday, non-bonused spend. This is a great way to rack up 7,500 Ultimate Rewards points per quarter on a no annual fee credit card. 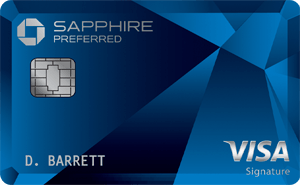 This card complements the Chase Sapphire Preferred® Card very well, given that the points from all cards can be pooled. British Airways has a distance based award chart which is extremely lucrative for shorthaul travel, as awards outside North America start at just 4,500 Avios one-way. Given that short flights are often disproportionately expensive when paying cash, I’ve found Avios to be invaluable. Earn 4 Avios for every $1 spent on all purchases within your first year up to $30,000. While the annual fee is high the card comes with lots of benefits that help negate the annual fee, and this is a great welcome bonus on this card. This card offers strong rewards for small businesses. No other card matches it for base earning on up to the first $50,000 per year. The American Express Membership Rewards cards are generally a better option for accruing Delta SkyMiles, but if you need the MQMs this card is worth considering. The MQD requirement for the qualification year will be waived if you make at least $25,000 in Eligible Purchases in that year with your Delta SkyMiles Credit Card. You earn Hilton Honors Gold status for as long as you hold the card. You also have the opportunity to spend $40k in a year and receive Hilton Diamond, though we generally recommend diversifying your spending instead. Earn 125,000 Hilton Honors Bonus Points with the Hilton Honors American Express Ascend Card after you use your new Card to make $2,000 in eligible purchases within the first 3 months of Card Membership. Earn a Weekend Night Reward from Hilton Honors after you spend $15,000 on purchases on your Card in a calendar year. Earn 6X Hilton Honors Bonus Points for each dollar of eligible purchases on your Card at U.S. restaurants, U.S. supermarkets, and U.S. gas stations. Earn 3X Hilton Honors Bonus Points for all other eligible purchases on your Card. Spend $40,000 on eligible purchases on your Card in a calendar year and you can earn Hilton Honors Diamond status through the end of the next calendar year. Capital One points are most useful for domestic economy flights, particularly if you have to travel over peak dates, but the new airline transfer option means these miles can be great for international travel as well. When flying Delta, this card gives you Delta Sky Club® access and allows you to earn up to 30,000 Medallion Qualification Miles and 30,000 bonus miles after spending $60,000 on eligible purchases in a year. If maintaining Delta elite status is important to you, this is definitely a card for you to consider. Earn 2 miles per dollar spent on eligible purchases made directly with Delta. Earn 1 mile on every eligible dollar spent on purchases. Find room for your carry-on and settle into your seat sooner with Main Cabin 1 Priority Boarding. Enter Delta Sky Club® at no cost and bring up to two guests for an exclusive rate of $29 per person per visit. Earn 15,000 Medallion® Qualification Miles (MQMs) and 15,000 bonus miles after you reach $30,000 in eligible purchases on your Card in the calendar year. Southwest’s Rapid Rewards program is revenue based, so these points will get you quite a bit of credit towards travel on Southwest. While Rapid Rewards points aren’t the most aspirational currency, they are extremely practical. This sign-up bonus can be especially valuable if you’re going for Southwest Companion Pass. Having the choice to customize a bonus category is smart for a card geared towards small businesses. 5% cash back on wireless telephone services purchased directly from U.S. service providers and U.S. office supply stores. 3% on the category of your choice from a list of eight and 1% cash back on other purchases. The card details for the Amex EveryDay have been collected independently by OMAAT and have not been reviewed or provided by the card issuer. If you make frequent transactions in a month the Amex EveryDay cards are a great option. In addition to accruing points in bonus categories, these cards offer an additional incentive based on how many times the card is used in a month. This can be quite lucrative, especially as these cards accrue Membership Rewards points. Membership Rewards points can be transferred to airline partners for the best value, or used to pay for all or part of your flight, prepaid hotel, vacation or cruise through amextravel.com. 2x points at US supermarkets, on up to $6,000 per year in purchases (then 1x); 1x points on other purchases. Use your Card 20 or more times on purchases in a billing period and earn 20% more points on those purchases less returns and credits. The American Express Membership Rewards cards are generally a better option for accruing Delta SkyMiles, but the MQD requirement for the qualification year will be waived if you make at least $25,000 in Eligible Purchases in that year with your Delta SkyMiles Credit Card. Earn a $150 statement credit after you spend $1,000 or more in purchases with your new Card within the first 3 months. This is a great card for small businesses, given the generous welcome offer and the simple earning structure. Pair this with the Ink Preferred to maximize your rewards! This is a great bonus for a no-annual-fee card, and the earnings structure can make this a very rewarding card if you want to earn points for Hilton properties. Earn 7X Hilton Honors Bonus Points for each dollar of eligible purchases charged directly with a hotel or resort within the Hilton Honors portfolio of brands. Earn 5X Hilton Honors Bonus Points for each dollar of eligible purchases at U.S. restaurants, U.S. supermarkets, and U.S. gas stations. Earn 3X Hilton Honors Bonus Points for all other eligible purchases on your Card. Enjoy complimentary Hilton Honors Silver status with your Card. Plus, spend $20,000 on eligible purchases on your Card in a calendar year and you can earn an upgrade to Hilton Honors Gold status through the end of the next calendar year. Earning unlimited 1.5% cash back could mean thousands of dollars each year going back into your business. Plus, a one-time $200 cash bonus once you spend $3,000 on purchases within 3 months from account opening. This card is great for road warriors as you earn 2 United miles per $1 spend on categories that you tend to have the most expenses on, plus priority boarding for you and companions on the same reservation on United-operated flights, a free checked bag, and two one-time United Club℠ passes each year. Earn 2 miles per $1 at restaurants, gas stations, office supply stores and on United purchases. Earn 1 mile per $1 spent on all other purchases. While it might not be the best option for the savvy traveler, it’s nice to see an airline introducing a no annual fee credit card. People often want to have a card from a brand they like, and lots of people like Delta. For a no annual fee card, the card is more generous than I was expecting. The MQD requirement for the qualification year will be waived if you make at least $25,000 in Eligible Purchases in that year with your Delta SkyMiles Credit Card. This is an amazing cash back rate if you spend a lot of money at supermarkets, department stores, and on gas. Cash back is received in the form of Reward Dollars that can be redeemed as a statement credit. Cash back is earned only on eligible purchases. This is a great no annual fee cash back card option. Cash back is received in the form of Reward Dollars that can be redeemed as a statement credit. Cash back is earned only on eligible purchases. The new Costco Citi cards have a great rewards structure for Costco loyalists. The bonus categories are compelling, and while it’s still not a card I’d personally use for everyday spend this is a solid option for Costco members. Receive a reward coupon annually which is redeemable for cash or merchandise at US Costco warehouses. 4% cash back on eligible gas for the first $7,000 per year and then 1% thereafter; 3% cash back on restaurants and eligible travel purchases; 2% cash back on all other purchases from Costco and Costco.com; 1% cash back on all other purchases; No annual fee with your paid Costco membership*. This is a great starter card for small businesses, with no annual or foreign transaction fees. The card details for the Amex EveryDay Preferred have been collected independently by OMAAT and have not been reviewed or provided by the card issuer. Earn 20,000 Membership Rewards® points after you use your new Card to make $1,000 in purchases in your first 3 months. 3x points at US Supermarkets on up to $6,000 per year in purchases; 2x points at US gas stations; 1x points on other purchases. Use your Card 30 or more times on purchases in a billing period and earn 50% more points on those purchases less returns and credits. The card details for the Hilton Honors Aspire card have been collected independently by OMAAT and have not been reviewed or provided by the card issuer. You receive top tier Hilton Honors Diamond status for as long as you hold the card. This card also earns an incredible 14x points at participating Hilton hotels & resorts. Earn 7x Hilton Honors bonus points on eligible purchases on your Card for Flights booked directly with airlines or amextravel.com, car rentals booked directly from select car rental companies, and U.S. restaurants. Enjoy one weekend night reward with your new Hilton Honors American Express Aspire Card and every year after renewal. Plus, earn an additional night after you spend $60,000 on purchases on your Card in a calendar year. This is a great starter card geared towards college students. Enjoy 0% Intro APR for 7 months on purchases from date of account opening; after that the APR will vary based upon your creditworthiness* Earn 2,500 bonus points after spending $500 in purchases within the first 3 months of account opening. For a no-annual fee card, this is a pretty rewarding option. And if you have a premium Citi ThankYou® card, you can pool your points for even greater rewards. - Points are redeemable for gift cards to popular retailers, restaurants, and department and home stores. 2,500 ThankYou® Points can be redeemed for a $25 gift card at thankyou.com. This card is designed for students, and encourages good habits and responsible credit use. This card has no-annual fee, and while it doesn't offer rewards, the other benefits may be useful for some. - 0% Intro APR on balance transfers for 21 months from date of first transfer. All transfers must be completed in first 4 months. After that, the variable APR will vary, based on your creditworthiness. - 0% Intro APR on purchases for 12 months from date of account opening. After that, the variable APR will vary, based on your creditworthiness. - If you transfer a balance with this offer, after your 0% Intro purchase APR expires, both new purchases and unpaid purchase balances will automatically accrue interest until all balances, including your transferred balances, are paid in full. The card details for the Marriott Bonvoy Brilliant card have been collected independently by OMAAT and have not been reviewed or provided by the card issuer. • Earn 3x points at U.S. restaurants and on flights booked directly with airlines. • Receive 1 Free Night Award every year after your Card account anniversary valid for redemption for a single night up to 50,000 points. Having Chip + PIN technology helps make this card easy to use when traveling overseas, but you won't earn travel rewards with this card. This card allows you to earn 40,000 LifeMiles after one transaction and you earn 2 LifeMiles $1 spent at gas stations and grocery stores. If you travel between the US and Central America/Colombia quite often on Avianca, the 50% discount on an award ticket for spending $12,000 and $24,000 each year can be useful. Earn 2 LifeMiles per $1 spent on Avianca purchases; Earn 1 LifeMile per $1 spent on all other purchases; 15% discount on purchases of miles with Multiply Your Miles. This card can be a good option for people looking to build their credit over time. If you're just starting out, or have limited credit, this is a good product for responsibly building your credit. Non-Affiliate Product Disclaimer: The information for the Amex EveryDay® Preferred Credit Card, The Ritz-Carlton Rewards® Credit Card, The Alaska Airlines Visa Signature® card, and Virgin Atlantic World Elite Mastercard® has been collected independently by OMAAT. The card details on this page have not been reviewed or provided by the card issuer.